Myron Michael "Mike" Kawa was born in New York on March 27, 1928, he joined Bell Aircraft Corporation in Wheatfield, New York in May 1951 as a structures engineer following graduation from the University of Detroit with a B.S. in mechanical engineering. The following year, Bell transferred him to its new location in Hurst, Texas, where he later became director of engineering for the successful Army Helicopter Improvement Program (AHIP), widely regarded as a model program for Army and Industry joint collaboration. 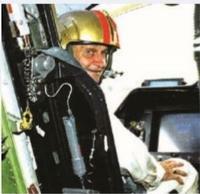 His work was considered “absolutely essential” in integrating the first digital cockpit and the first digital FLIR into an Army platform, the Bell Helicopter OH-58. Lt. Gen. William H. Forster, USA, then program manager, recalled that under Mike Kawa’s leadership the program was always “on time, and on budget.” Later, he served as lead engineer in Operation Prime Time, the successful effort to integrate weapons into the OH-58, which subsequently became known as the OH-58D Kiowa Warrior. A former vice president of AHS International, the Society awarded him its AHS Honorary Fellow Award in 2001 during the AHS Annual Awards Banquet in Washington, D.C.
and fellow engineers, passed away on November 17, 2006 following a brief illness.